Click on the bars below to all the subdivisions and condo & townhome complexes in Castle Pines. You can also view the most popular searches such as ranch style homes, new construction, homes with a pool or houses with mountain views. Click to see Local Subdivision and Complex Maps. Castle Pines is a city that offers a classic Colorado experience nestled on the edge of the Great Plains along the west of Interstate 25. Located 20 miles south of Denver, Castle Pines celebrated its 10-year anniversary of holding city status in 2018. Noted for its excellent infrastructure and unique character, Castle Pines CO is a community set against some of the most spectacular scenery. Rolling hills give way to the foothills of the Rocky Mountains in the distance. However, the city is still well-supplied with amenities and is close enough to the city of Denver for access to big city infrastructure and travel. Homeowners have flocked to Castle Pines and made it among the most popular property destinations in Colorado. Homes in the city are diverse and created in developments that are conscientious of balancing building with maintaining open space. Security is a big part of living in Castle Pines Colorado, and the gated communities of Castle Pines Village, Daniel’s Ridge, and Whisper Canyon are noteworthy as safe subdivisions. Such is the popularity of the city, subdivisions are ever evolving, and new developments are enticing homeowners. One such example is Castle Pines Valley, a modern and dynamic new subdivision developed by Lennar Homes. As a link between urban and outdoor living, many subdivisions in Castle Pines offer luxurious properties set amongst generous plots of land. Charter Oaks and Claremont Estates offer buyers spacious one- to three-acre lots that let homeowners connect with the natural wonders of Colorado within the comfort of their own elegant homes. For true access to the outdoors, Daniel’s Gate has direct links to the Daniel’s Park trails and is one of the largest subdivisions in Castle Pines. Choosing to live in the unique subdivisions of Castle Pines is about embracing an upscale lifestyle and reconnecting with Mother Nature. Eye-catching neighborhoods provide a sense of community full of unique spirit, and homeowners in Castle Pines will never be short of things to do. 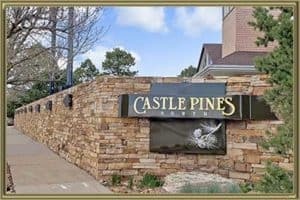 When living in Castle Pines CO, it is hard to ignore the splendor of the natural surroundings and the city does an excellent job connecting people with the great outdoors. Retreat Park is a five-acre urban greenspace with play areas, sports fields, and picnic greens that is a popular place for residents in “The Retreat” neighborhood. For a more rugged experience, Coyote Ridge Park spans 15 acres and offers wonderful hiking trails, shaded pavilions, and BBQ areas. For a leisurely afternoon or a competitive round around the greens, The Ridge at Castle Pines North is a leading golf course that is considered one of Colorado’s best upscale golfing locations. Douglas County Libraries in Castle Pines is located in the heart of the city and serves as a community hub hosting numerous events through the year. Including a café and learning annexes, the library (13,000 square feet) is beloved by residents throughout Castle Pines. Despite being a relatively small city, Castle Pines is home to an excellent art gallery in the form of Castle Pines Arts & Cultural Foundation. CPACF hosts several annual events in the city, including Summer Solstice Fair and Fall in the Foothills. See a complete list of attractions and things to do in Castle Pines. Castle Pines has much to offer, including an excellent selection of restaurants and shopping centers around the city. With so much available in terms of location, home choice, and amenities, there is no wonder Castle Pine CO has become such a popular place for potential homeowners. That’s why our expert real estate agents are available right now to guide you through the best Castle Pines has to offer, including homes in all the city’s leading subdivisions. Gold Compass Real Estate can also help you sell your property in Castle Pines with our expert knowledge of the local area. Our on-location real estate agents can provide you with a Castle Pines Home Value Instantly Online while contributing advice on pre-listings and valuations. Our Castle Pines real estate team is available whether you are buying or selling a property in the city. The Gold Compass online database is regularly updated to ensure property prices are fully up-to-date in accordance with the current market. With a Free Personalized Market Report, you can understand the local market and have the confidence and knowledge to find your home in Castle Pines. Call the Gold Compass Real Estate team at 303-325-5690 to chat to our Castle Pines Colorado real estate experts.